In order to get you excited for the upcoming Paris Masters, here is a look back at one match of probably the most random hot streak in recent history: David Nalbandián’s tear through Madrid and Paris in 2007. Not much is at play this year in Bercy, but maybe, just maybe, we’ll get something special, like what happened five years ago. There is an annoying paradigm among tennis fans and journalists that somehow, only epic struggles are meant to be remembered. And it has to be a final. And it has to be at Wimbledon (OK, I’m exaggerating a bit). Any straight set match is automatically dismissed from any “best of the year” discussion. While many tightly contested straight setters full of excellence get left behind, a special kind of casualty results from this way of thinking: the virtuoso peformance, aka The Epic Beatdown, aka The God-Mode Demonstration. Usually people remember tournaments where somebody got hot, but the individual matches get forgotten, lumped into a pretty simplistic narrative. If you follow tennis obsessively – and you probably do, since you’ve somehow landed on our site – you are familiar with the Nalbandián Magical Fall of 2007 legend, where the underachieving Argie went against his own tendencies and for one surreal month looked like the third best player on tour. Or the second best. Heck, he looked like the best men’s player at that particular moment. Most casual fans of tennis might have skipped this truly remarkable happening, only to learn about it at some point before or during the 2008 Australian Open, since Nalbandián was picked as one of the favorites (!!!) for the title. Their reaction was probably a variation of “Wait…what? Nalbandián? Really?”. Why did casual tennis fans miss this? Simple: it happened during the Part of the Tennis Season that Shouldn’t Happen but Somehow Keeps Happening: the two plus months after the US Open. We all know the drill: guys and gals get tired, all four Slams are in the rearview mirror, and somehow they’re all expected to go out and do a tour around Asia and indoor arenas across Europe, pretending to care. It’s strange, and it’s nonsensical. However, there’s some good money to be made, and also, valuable ranking points. Hence, people show up. And because we’re tennis junkies, we also show up and watch people play tennis in China, in Tokyo or in some godforsaken parking lot in Luxembourg. Thankfully, our addiction dedication gets rewarded every once in a while by something truly special. Just like it happened five years ago, with a very unlikely protagonist. You get the point. David Nalbandián wasn’t very good in 2007. Far from good. Barely mediocre. Probably injury-addled. But for a talented 25 year-old guy in what should have been his prime, his results that year left a lot to be desired. What’s worse, Nalbandián arrived in Madrid with the added pressure of having to defend Finalist points; Federer waxed him in the final the year before. Even after such a dismal season, Nalbandián had managed to stay in the top 25. However, another craptacular showing in Madrid would’ve meant probably slipping out of the top 30. Or top 40. Notice how Nalbandián managed to beat the top 3 players in the ATP at the moment in consecutive rounds. Heck, he trashed Nadal in his own country. Straight-setted the recent US Open finalist and rising star Novak Djokovic. And somehow avenged his 2006 final loss to Federer, after getting breadsticked in the first set. But notice that R32 match. Nalbandián was down a set to Berdych – and might have been a set and a break if memory serves me right. Nalbandián found a way to gut out that win, and it was on. He didn’t lose another set on his way to the final. And won his first Masters Series shield. Now, back then the schedule was a bit more nonsensical than these days, and they had a week off between two fall Masters Series. So Nalbandián went to Basel after Madrid, lost in the first round to Stan Wawrinka (because that’s something Nalbandián does even when he’s possessed by the Tennis Gods), and arrived in Paris with enough time to recover from his incredible week in Madrid. Yep. He beat Federer and Nadal in back-to-back Masters Series. What’s more, he met one or the other in both finals. And won both times. The mystery player is none other than Richard Gasquet, the then #13 player in the world and someone who had just gone through Tsonga, James Blake (ranked #7 at the time) and Andy Murray (ranked #12). He was playing at home and playing well (a rarity, I know). Yet he still got trashed 2 and 4. It should’ve been 2 and 2, but Gasquet came up with some incredible tennis of his own to get back one of the breaks in that second set. Was Nalbandián as good as Gasquet hints at? Yes. Yes, he was. And thankfully, someone else out there agreed as well, and uploaded the video below to YouTube, giving it a simple title: “Nalbandián at his best @ Paris 2007”. Even better, the 7 minute video is all meat and no fat: whoever compiled this kept only the points for us to enjoy. And all the good ones, really. So please, take 7 minutes and 27 seconds of your day to enjoy unbridled tennis excellence. It’s quite mesmerizing. – Right at the start you could see that Gasquet was in trouble: Nalbandián starts the match by yanking Gasquet from side to side, pushing him deep into his BH corner, and finishing him off with a beauty of a dropper. – At 1-0 (0:42), Nalbandián goes for the kind of FH winner that you don’t normally see: instead of going for depth, he goes for a tricky angle: the ball bounces a few inches from the service line and the sideline, then goes away from the court like a slice serve from the deuce court. The second bounce is almost past the doubles alley. – At 0-2, 30-15 on Gasquet’s serve (1:05), you can see the first of about four obscene cross-court backhand return winners by Nalbandián. – The very next point (1:11) is a staple of the Nalbandián Folk Hero Story: a long rally turns into a short-lived contest of who hits the most outrageous angles. Midway through the rally, Nalbandián hits an angled FH that lands about a foot short from the service line, but forces Gasquet to hit his ensuing angled FH from way outside the court. The Frenchman is actually standing just in front of the “Gerflor” writing on the court. Past the doubles alley. Of course, this is the objective of Nalbandián’s shot: yank Gasquet far away from the court so he can have plenty of real estate to finish off the point. Which Nalbandián does, with a down-the-line forehand winner. – At break point later in that game (1:40), Gasquet kinda frames a backhand, which puts a crazy angle on it. Nalbandián goes for an extremely low-percentage down-the-line forehand…and is supremely annoyed when he hits it into the net. But pause the video at 1:42 and look at where he’s standing. Yep – behind the chair umpire, and quite close to a bench. – At 1:43 a fun rally ends with a silly Gasquet response to a pretty bad dropper by Nalbandián. Result: Gasquet gets humiliated by a beauty of a lob. Because that’s what happens to you in this match. – At 2:18 you can see a pretty great Gasquet backhand winner from the middle of the court and into Nalbandián’s forehand corner. Supremely difficult shot to hit, but this is Richard Gasquet, so we’ve seen that before. This is just to illustrate that Gasquet was not sucking in this match. At all. – At 2:29 and 0-15, we have the second of Nalbandián’s obscene cross-court backhand return winners. And the very next point we see is break point, where Nalbandián decides to mix it up by hitting a down-the-line backhand return winner. – You’ll notice that sprinkled here and there are some pretty great Nalbandián aces. Aces. You read that right. Nalbandián never hit his forehand or served as well as he did in this month-long stretch. – At 4:00, another example of a cross-court forehand angled winner. This one is a beauty. You can’t see anybody getting to this shot. It’s paradigm-shattering, really. Nobody finishes with the forehand like that, as if it were the easiest thing. And it sets up break point at 1-all in the 2nd set. Which he then takes with a magnificent combination of cross-court backhands. The second one, which goes for a winner, replicates the angle used in the previous forehand. There’s nothing Nalbandián couldn’t do on this day. – At 4:14, 2-1, 15-all, a magnificent rally. Gasquet survives the first angled exchange on the backhand side, but not the second. The cross-court angled forehand that Nalbandián hits near the end of the rally should’ve ended it – it was that good. But Gasquet (remember, he wasn’t sucking) somehow got to it, forcing Nalbandián to finish him off with a tricky down-the-line backhand. The forehand was just outrageous, though. – There is not much more you can say after Nalbandián’s third cross-court backhand return winner at 5:25, other than THAT WAS FREAKING CRAZY. Obscene. Orgasmic. Just impossible to deal with. He absolutely crushes that ball…from the doubles alley. Ridiculous. That sets up break point to go up two breaks, and an overwhelming point later, Nalbandián is up 4-1 in the second. He is absolutely possessed. – Yet another obscene cross-court backhand return winner. Hit from the doubles alley. These are not bad serves that Nalbandián is killing. Poor Gasquet. – The last minute of the video is quite fun. Gasquet wins a long rally by guessing right on a pass, and the crowd erupts. He carries that momentum into the 5-2 game, where after some pretty incredible shots, he actually breaks Nalbandián. Again, Gasquet was not sucking that day. He then carries that momentum into the 5-4 game, where he hits an obscene Gasquet-trademark down-the-line backhand to go up 0-30 on Nalbandián’s serve. They then play a fantastic point, started by a blistering Gasquet return, which ends with yet another angled forehand exchange that Nalbandián wins. He’s angry now, probably at the crowd. Then again, we know a reason is merely optional for Nalbandián to get angry on a tennis court.. A couple of great serves come after that, and it’s over. This match lasted all of 68 minutes. It was a masterclass that was as rare as it was mindblowing. After the match Nalbandián would say that he was playing about as well as he was back in the Shanghai Masters’ Cup final in 2005, when he beat Federer in a classic five setter. And he was partly right. I think he was better here. The narrative about this Nalbandián Magical Fall of 2007 is that the top guys were tired, and Nalbandián benefitted from being mediocre all year, since it had left him fresh to run rampant. Which is partly true. However, you still have to manage a level of tennis that is truly special to win two Masters Series in a row, particularly from Nalbandián’s position – no byes for him on either tournament, and he had to play Federer or Nadal in both Finals. In finals, too. Maybe the explanation is simpler: a supremely talented individual in his physical prime finally got his act together. Everything worked: the movement, the serve, the forehand, the backhand, the droppers, the volleys, the return. There were no holes for anybody to exploit. Maybe that’s why Gasquet said what he said. In the 68 minute masterclass he received, he saw it all: great serves. Great returns, off both wings. Amazing court coverage. Incredible defense from both wings. Incredible counterpunching. Amazing feel for touch shots. And he saw angles that he didn’t even knew were there. Nalbandián made the tennis court look fat that day. Or rather, he saw the court as if it were wider than anybody knew. It’s funny that even after winning two Masters Series, Nalbandián didn’t make it to that year’s Masters’ Cup. Think about it. He was so bad before Madrid that not even a thousand points (back then) got him into the final showdown. Which cast a weird shadow over that event, since many felt the best tennis player at that particular time wasn’t in the event that’s supposed to showcase the eight best male tennis players in the world. And then came all the talk about how Nalbandián was obviously one of the big favorites to win the Australian Open, thus ending his tenure as “The Most Talented Player Never To Win A Grand Slam” (a title that he lost to Andy Murray, but which has since returned to him given the events at Flushing Meadows this year). Many believed this would happen. Heck, I believed this would happen. It didn’t. It wasn’t even close. If you don’t remember what transpired in Australia, it’s a short, sad story. Nalbandián played the recently retired Juan Carlos Ferrero in the third round. I repeat, Third Round. He managed to win only six games over three sets, losing 1-6, 2-6, 3-6 in an hour and forty three minutes. Ferrero then lost to Ferrer in the next round and ended the year with a less than impressive 21-15 record. So there. Five years have passed since Nalbandián’s magical month, and while he got to keep the trophies and the nice cash for winning those two Masters Series (he never made a M1000 final again), we at least have YouTube videos like the one above to remind us of that brief time when David Nalbandián was the best male tennis player in the world. Was it a tease? Yep, it ended up being one. But my, what a glorious tease it was. But there’s a couple of things I’d like to say. Nalbandian had various injury problems in 2007 (back, abdomen and knee, if I remember correctly). They didn’t sideline him for weeks on end but they made it difficult enough for him to do well. He took a break between the US Open and the indoor swing. To get fit but also to work with the new coach he had just hired after having been without one for well over a year. That new coach was Martin Jaite (now Argentina’s Davis Cup captain), who did Nalbandian’s game a lot of good. During the 2007 indoor swing, Nalbandian lost to Wawrinka not just once but twice, first at Vienna (the week before Madrid) and then again at Basel. Against Berdych at Madrid, Nalbandian went down a set and a double break. He lost eight games in a row, from 4-2 to 4-6, 0-4, before turning the match around. If players were asked about their easiest opponents (and not just about their toughest ones) then Gasquet would probably be right at the top of Nalbandian’s list. Going into that match, he had a 4-0 record against Gasquet, having bagelled him in 3 of those matches. I think that this also had an influence on Gasquet’s assessment. By now, the record stands at 7-0. To prepare for the Australian Open 2008, Nalbandian wanted to play the Kooyong exhibition. During a practice session ahead of the event he suffered back spasms and had to pull out. He somehow managed to survive the first two rounds at the Australian Open, also thanks to a kind draw, but that was as much as was possible under the circumstances. 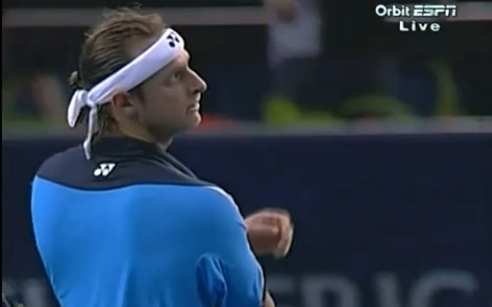 The thing with Nalbandian is that he doesn’t talk much about his injuries. And if at all, he talks to the Argentine press. So most of his injuries go unnoticed by the English-speaking media, blogs etc. My favourite match from the Paris week still is the one against Federer. Though I also had a great time, watching Nalbandian dismantle Gasquet again. Those two weeks showed what he was capable of back then, healthy, fit, playing with plenty of confidence and in the conditions he likes best. Indoors, where he can “feel better the ball”, as he’d put it. He gave us a little glimpse of it again at Stockholm, last year. Here’s hoping he’ll still be around for next year’s indoor swing. Julia, thank you so much for that amazing comment. It’s a fantastic post scriptum. I really wish I had included all of this in my piece. The Stan losses could’ve been good for another couple of jokes, at least. That’s such a weird H2H. And the Jaite thing was important, too. Why do you think that partnership ended? I also wish I had looked at the Gasquet H2H. It’s quite epic. I do think that the English speaking media makes no attempt at gathering news in Spanish for players from Spanish-speaking countries. It happens a lot with the Spaniards. However, I also think that Nalbandián’s peculiar attitude towards journalists in general rubs them off the wrong way. And you know how journos are: if you are all smiles and give them your time, they’ll love you. If you don’t…they won’t. I lived in Argentina from 2003-2006, and following Nalbandián was interesting there. It didn’t seem like anybody had real access to him. Always a mystery, even to his own people. The thing about the injuries, though, is that they reinforce the narrative about Nalbandián never really being in top shape. I know his complexion will never make him look like Federer or Djokovic, but even in 2007 he looked like is usual 10-pounds-too heavy self. Not that it affected him there in the least bit. But the injuries always pop up, even if he doesn’t talk about them – who can forget that stomach muscle pull at the French Open semis in 2006 vs. Federer? He was in complete control of that match when it happened. It seems like you only get the benefit of the doubt about an injury if you look like a Greek statue. And not even then, since Nadal gets continously questioned about his ailments. I wonder if Nalbandián will pull one of his random runs out of nowhere at next year’s Australian Open. If he’s healthy by then, and gets a favorable draw…who knows what can happen. He just can’t face Wawrinka. Well, I’m a Nalbandian specialist, you probably guessed as much. I’ve been a fan for many years and I keep a blog about him (Vamos David). One of my aims with the blog is to present a more rounded, though not idealised picture of David Nalbandian. He’s definitely not the easiest player to blog about or follow but well, he’s my favourite. The partnership with Jaite ended simply because Jaite no longer wanted to travel all the time. He wanted to stay in Argentina and focus on other things, like being the tournament director of the ATP event in Buenos Aires. But the job he really wanted he has now: Davis Cup captain. I’d say Nalbandian’s attitude towards journalists is a rather straighforward one – he doesn’t like talking to them and doesn’t pretend otherwise. I think that the Argentine journalists are (and have to be) more willing to put up with it than their British or American colleagues. Though he’s generally a lot more forthcoming if he gets to talk in Spanish. I agree with you about the disinterest the English-speaking media show for news in other languages. But I also get to see things that are simply false. My favourite example in this context: Gervasio Esteban Ezekiel Nalbandian. Many people think that’s his full name when it actually was just a bad joke someone made on Wikipedia. But thanks to Bodo, who fell for it and posted it on his blog back in 2007, the myth was born. And it’s still alive today. During the 2007 indoor swing I thought and still think that Nalbandian looked to be in perfect shape, also concerning his weight. He’s slimmer these days than he used to be, has been ever since a bad bout of flu last year. But the injuries and the surgeries have taken their toll, even if people don’t always know about these things. The Roland Garros semi was one of the only 3 matches he retired from in his career. And in that case everyone could see what had happened. But Nalbandian also spent 14 months playing with a serious hip injury and didn’t lose a word about it until he literally couldn’t play anymore. During those months, there were all sorts of weird results, matches where he started well and then fell apart completely, or seemed to have given up from the start. And of course people called him a choker or said he didn’t care about tennis – but the real reason turned out to be a very different one. As for making another random run, right now, we don’t even know for sure whether Nalbandian is going to play another season. He said he’ll decide at the end of this year but so far, he hasn’t made his decision public. You really are a Nalbandián specialist, Julia. A true authority. And I agree – you couldn’t have picked a trickier player to focus on. When I read the last paragraph you wrote I remembered that I had read the same about Nalbandián’s next season. I think if he’s lucky with injuries and gets himself in shape, he can still contend. His brand of tennis is still as valid as ever, particularly with the growing emphasis on the return of serve. But we do know it’s always so tricky to come back after the hip surgery. I have no idea how Hewitt keeps plugging along, even with the recurring problems he’s had. One thing that always baffles me is Nalbandián’s career win-loss record: 377-187. Andy Murray has this record: 376-120. And here is Djokovic’s: 464-122. These are guys that are five years younger than Nalbandián. Five! The other case I wanted to mention is Tommy Haas, who if anything, has been even more unlucky than Nalbandián with injuries. His career win-loss record is 500-283. He’s plugging away at 34, even if he still gets injured once a year. And we also have the aforementioned Hewitt. The general point I want to make is that while Nalbandián certainly has had bad luck with injuries, he’s never convinced me that he has the hunger and the desire to be out there on the tennis court day in and day out. We know of the tournaments missed due to watching WRC competitions. He’s always truck me as someone who in the back of his mind, always wanted to be doing something else. Even when he talked in interviews about winning a Slam , I always got the impression that he was saying it because he felt he should. And he was right: someone with his skills should have set that kind of goal for himself. The one that got away was that AO of 2006. I still don’t know how he lost that SF to Baghdatis. Forgive me if I’m being harsh, but Nalbandián once was my favorite player. You criticize because you care, no? After this exchange we’ve had, I’m thinking that we’ve seen the last of Nalbandián. Unless he manages to coax DelPo into one last Davis Cup run. But given the events in Buenos Aires a couple months ago, that seems unlikely. If you spend a few years blogging about a player there’s no way around becoming a specialist. And hopefully a bit of an authority on the subject. Even if that subject tends to be unruly. As for the career match record, well, of course Murray and Djokovic play more matches than Nalbandian. They usually get to play full schedules, they go deep at most of the events they play, they reach more finals and win more titles than Nalbandian ever did. For them, it’s normal to play 70-80 (or more) matches per year. The most Nalbandian ever managed was 63. And ever since 2008 that number has been stuck in or below the 30s. I wish I could take hope from the examples of Hewitt and Haas. But whether to retire or keep on playing is a personal decision each player has to take for himself. Missing tournaments to drive or follow rallies, or tanking matches to watch football – those as well are myths. If he didn’t have the hunger and the desire to be on the tennis court day in and day out, then why did he even bother, coming back after hip surgery? He could’ve just said – that’s it, from now on it’ll be rally driving for me. But no, three days after surgery he was back at the gym, working on his comeback. I’m not saying he’s the hardest worker the tennis world has ever seen. But he’s also not the laziest, most disinterested player the tennis world has ever seen. Nalbandian reached the final the first time he played Wimbledon and then went on to regularly make it to the QF/SF stage at the other Slams. I think he was (and had reason to be) serious about wanting to win a Slam. It’s just that after the two semis in 2006, his chance was basically gone. 2007 was difficult, as mentioned before, 2008 the hip injury appeared – the end. That it took him until this year to publicly say, I know I’ll end my career without having won a Slam, simply shows, I think, that it can’t have been easy for him to realise and admit it. I don’t know myself how he managed to lose that match against Baghdatis. But I’m also not sure he would’ve had a chance against Federer in the final. US Open 2003 would seem more likely though he was out injured after that semi. As for the Davis Cup, Del Potro didn’t do himself a favour with the way he handled the situation during the semifinal (and ahead of it). Though the underlying, more basic problems date back of course to Mar del Plata. I guess he’ll skip the first round again next year, like he usually does. But I can’t imagine he’d abandon the team. I simply hope Nalbandian is going to play one more season, whatever it’s going to look like. I have a feeling that he will but that might be wishful thinking. And no, I don’t think you’re being harsh. I know I come across like Nalbandian’s chief apologist here but there are enough things about him that annoy me.